I've never liked personality tests. Take me as I am. Or get to know me as we go along. But no, Hezekiahs aren't allowed to relax. You're at school and fill one out and they call you to the office and accuse you of being a Stub. Never a good feeling. Fortunately, in my case, I knew they were wrong. I'd never a Stub! They always think Hezekiahs should act strictly like Hezekiahs, which, ironically, would be Stub behavior. A true Hezekiah is going to veer into Stub territory now and then, and hurry back out. Because it's give and take. Strictness isn't key to the true Hezekiah. But the big problem was that those who make the tests are Stubs, and naturally they interpret the results in a Stubbish way. Just in case you weren't around for Hezekiah and Stub, which we used to have in school, they're two dogs. Hezekiah likes to hunt, Stub to guard. But things happen to keep it amusing, like Stub might chase a squirrel off the property, unaware there's a burglar, too, who trips over Hezekiah sleeping, meaning Hezekiah saves the day! There's so many of these old stories, it's probably only natural that they'd come up with offshoots, like personality tests. I often think of Hezekiah and Stub, and put my own spin on life through them. Like this: The theoretical pure Hezekiah has no resistance in life, going along with the flow, surviving. The theoretical pure Stub has complete resistance, is in control, and so dies. Of course there is no pure Hezekiah or Stub after those terms, at the extremes. It's all a matter of tendencies on a scale. To me, the names themselves speak to how they're termed. Hezekiah is a lazy sounding hound, occasionally lifting an ear to note the passing of a train or send a fly on its way. Stub is a super-efficient sounding dog, lean and muscular, sleeping, perhaps, but fully alert to everything. And that's the way they looked. Hezekiah can be roused from his equanimity, but it takes a truly necessary reason. Stub is efficient, therefore more alert and controlled by events. Hezekiah tends to be self-reliant, flexible, and nice (or indifferent.) Stub is hard and can be mean, being the opposite in terms of flexibility. On and on. Of course, the Hezekian philosophy of life is the one that sounds best to me, if I could live up to it. Good old Hezekiah has an innate knowledge that All is One; he is not in competition, opposing life, but seems himself integrally one with what is. Hezekiah might think, "Yes, if I reach up to steal food, I might get my paw caught in the band-saw, but I might not." (Frankly, I'm more cautious than that.) Stub knows all the angles and is never content with might/might not. That sounds the wisest for survival, and as I said I also can be quite cautious, because angles can change unexpectedly, meaning security can quickly become a false security. But Hezekiah also knows you're going to get it in the end, whatever cautions you take. Our whole perspective on life and mortality are at issue here, as I was just getting at. And you know how it generally is with actual dogs, apart from being babied by modern owners taking them to the vet to put them down. They seem very stoic, crawling to isolation somewhere and simply dying. In the Hezekiah and Stub stories, though, Hezekiah has a looser grip on his personal existence. He seems more prepared to die ... "Just let me get through this one last meal, thank you kindly." Then he goes on to a ripe old age. I believe that's me. But Stub is rigidly opposed to his own demise, while being unsympathetic to others. I've always seen a contradiction in that: Is Stub already dead in some sense, clinging to life as he is with a bad attitude? It's only a matter of time before Stub dies, standing up, and rots away. Then his skeleton will be found in place, appearing still to be on guard! Would serve him right. 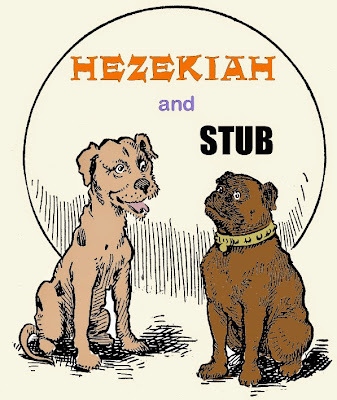 * The "Hezekiah" and "Stub" characters -- ©1925, renewed 1943, Institute for Dog-People Research -- are now public domain. Stub was originally gray but re-imagined as brown in the 1940s, when the Nazis' dog mascot "Fuery" also appeared to be gray. We say "appeared to be gray" because his only appearances were in black and white illustrations, meaning he could very well have also been brown. 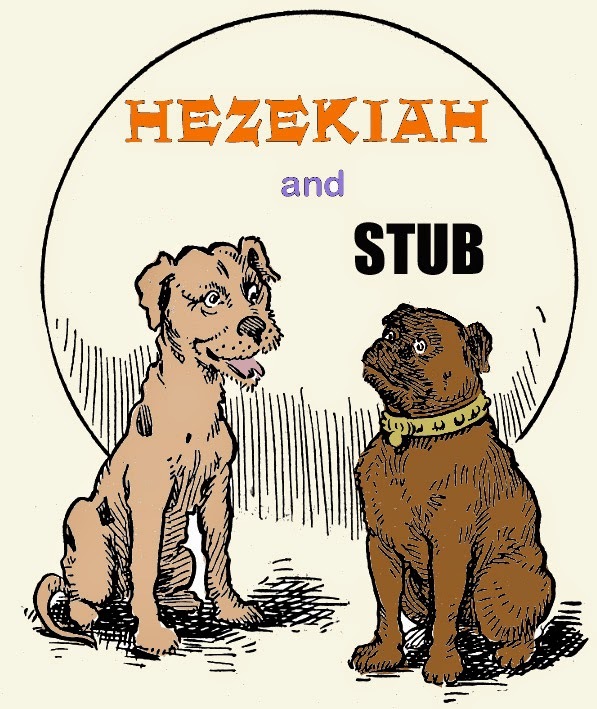 Hezekiah and Stub were very familiar friends to schoolchildren since their first appearance in the 1920s until they were phased out for use in public education in 1966. In the 1930s they were credited with the great accomplishment of ending the Great Depression. But by 1966, with the rise of secular humanism, situational ethics, the godless one world government, and color TV, they were gone.